We are living in an age where it is possible to grow anything anywhere and anytime. You don’t have to wait for the weather or season to change. It is now possible to produce plants indoors or in a greenhouse all year round – how things have changed! You don’t need to cross out the days on your calendar waiting for when the time is right to put seed in the ground. You can order a greenhouse and create the best conditions for your plants. Depending on the number of plants you want to cultivate, you can order the most appropriate greenhouse based on size and quality. To help make the right choice, we include a list of the best greenhouses below. Before you can decide on a greenhouse, there are several things that you need to think about. Don’t just rush to check out a product before you are sure it’s what you want. Price: the cost of the greenhouse corresponds to its size. If you are looking for something substantial to cover a large number of plants, then you will need to invest more money than you would have for a smaller unit. It, therefore, goes without saying that a bigger unit will attract a heftier price and a smaller one is more affordable. Strength: chose your greenhouse depending on the kind of weather characterizing your area. Go with sturdy enough material to handle it. Flexible covers in places of heavy snow should be avoided. The design of the greenhouse you choose should keep strength in mind. For example, it is not right to use big and oversized material that does not fit well. If the tent fails to hug the framing well, then that is an accident risk in times of intense wind –remember this is not a sort of boat that you can set sails. If your area is continuously windy, you can always go with the double-walled versions – they are much more resilient against wind damage. Lighting: plants require adequate lighting for growth and germination. However, different plants need different levels of sunlight. Determine how much light is sufficient for your plants and then go for the right panel gaze – can be transparent, opaque, and semi-opaque. The stages of plant growth you will be dealing with must inform you of the proper lighting. Growing plants from seeds may need a little bit more light than any other. Polycarbonate greenhouses have grown in popularity, and it is all for a good reason. The light that goes through this material is filtered, and so you may not need shading during summer. Insulation: this property depends on the climate condition of the area that the greenhouse will be. Snowy conditions require sound insulation and a sturdy roof. If your greenhouse will be in cold regions, polycarbonate – single walled – will be more than appropriate. Size: you need to choose a greenhouse according to your needs and available space. You cannot purchase a big greenhouse if you only have a small portion of land – where will you take the extra material? If you have a large area, then large greenhouses are good. They can incorporate a nursery, as well as be an excellent growing area. Ventilation: greenhouses can sometimes get too hot when the sun is shining bright. If not careful, the resulting heat can literally turn your plants into dessert. Proper ventilation will allow any heat build-up to escape and some fresh air to enter. The consequences of inadequate ventilation are dire – you may wake up one day to find all your plants diseased. In right weather conditions, you should be able to open up vents or other spaces to let in fresh air that will do some good to your plants. You can go the automatic vents way if you are always away from your garden for a long time. Landscape: before you start searching a greenhouse for your tomatoes or agaves, determine where it is going to be located. Typically, it is no big deal where the greenhouse is facing so long as it is receiving a good dose of sunlight. Your peppers and tomatoes need it to ripen and be ready for the market. All in all, an open field with no shades is the best for the greenhouse. Heating: serious farmers need to consider how their plants will survive the winter. Heating is a good idea as it will keep your greenhouse frost-free. However, this is optional. With proper maintenance, your plants can still manage to do well in the cold. Choosing between wood and aluminum: this depends more on individual preferences. However, wood framing for your greenhouse requires much more maintenance. Aluminum is easy to deal with but is more prone to condensation. It will also require it will also require shading, insulation and individual clippings – all these may prove costly for you. It is not everyone that wants a greenhouse only for the potted plants. Some are looking for something substantial to cover the plants in the garden. 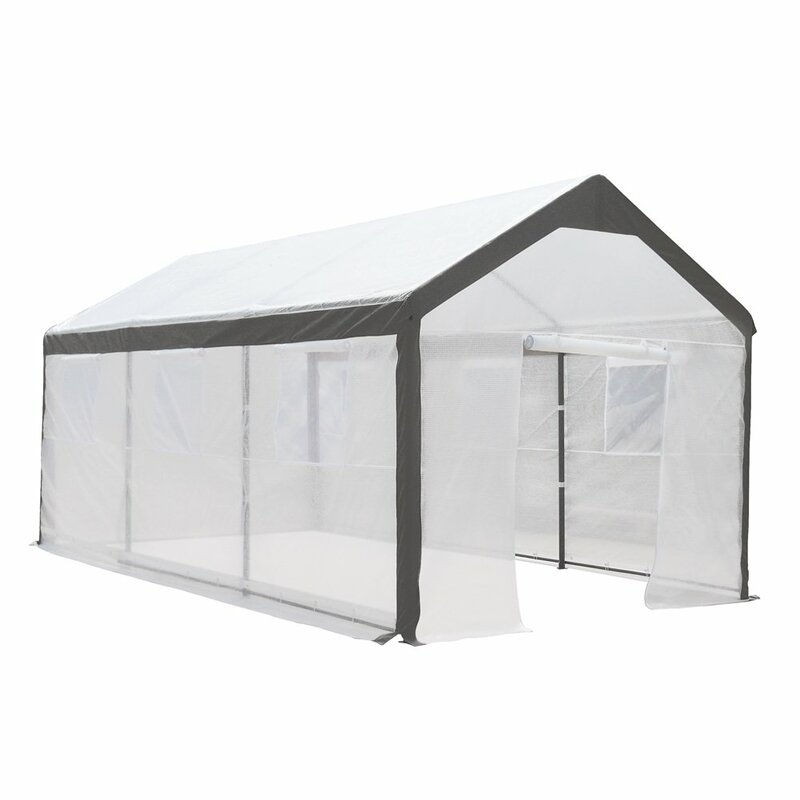 This product comes in a durable and robust cover that keeps the bugs out and allows adequate sunlight through. It is both water and UV light resistant meaning that your plants are adequately protected. If you are among those people that love fruit planting, then you may not need to worry about the height. This greenhouse is up to 9.4 feet making suitable for fruit growing. For some people, something that is easy to assemble is among the most attractive. Not only is this product easy to put up, but it has also screened ventilation spaces for efficient airflow for plant growth. This greenhouse uses PVC construction which can give you an extended period cultivating your favorite plants. The unit protects your plants from UV rays thus keeping them green for longer. However, the transparent plastic may easily spit when the temperatures go down significantly. This may create gaps for insects and other bugs. Some of us just want something compact and easy to prolong the growing season. Fortunately, this product from Quictent may be the right one for you. The heavy-duty steel it comes with help keep it standing even when there is high wind. With this mini greenhouse, you need not worry about ventilation. The two large doors ensure that your plant is receiving the necessary airflow for efficient plant growth. This greenhouse may be the best one for beginners and those that have a small gardening space and just need somewhere to grow their plants throughout the year. Can protect your plants from the extremes of weather. If you are looking for a greenhouse to keep your seedlings and other young plants from bad weather and conditions, this may be the product for you. It has eight shelves on both sides allowing for more plant storage and a zippered door for easier access. To ensure that the plants get good air circulation, the greenhouse has screened ventilation. It also has a stable construction that may easily withstand tropical storms winds. If you are looking for a greenhouse to grow your potted plants throughout the year, this could be among the best greenhouse you can choose from. Any gardener looking to try something new usually can’t wait to start. If that is the case, then you need something that comes out as easy to setup and use. This mini greenhouse may just be the right thing. It is compact enough for your potted plants and assembles within minutes – you don’t need any tools for this. The steel frame is powder coated for durability, and strength. 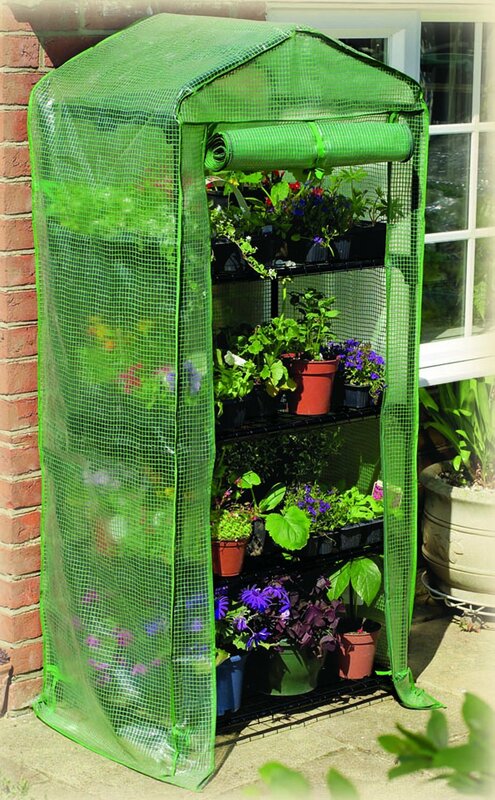 You can easily access your plants through the rollup zippered door. The material of this greenhouse is top quality and will protect your plants from the elements and marauding pests. 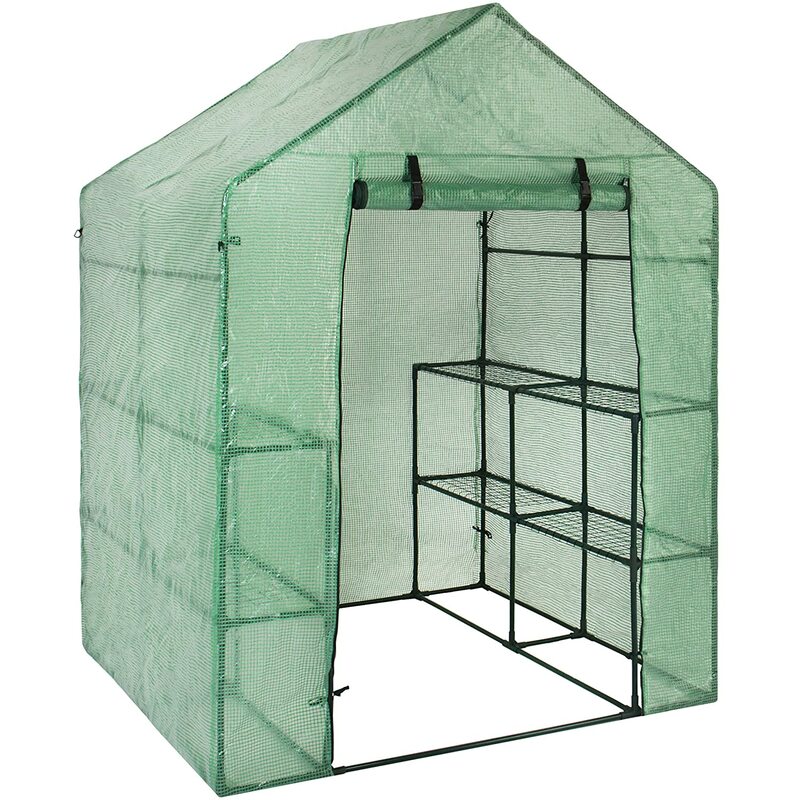 However, you may need to setup this greenhouse by a wall as it may not withstand strong winds. Greenhouses are a great way to grow plants throughout the year. Mostly, they protect the plant from the harsh weather and pests. They provide the right environment for optimum growth in all the seasons. 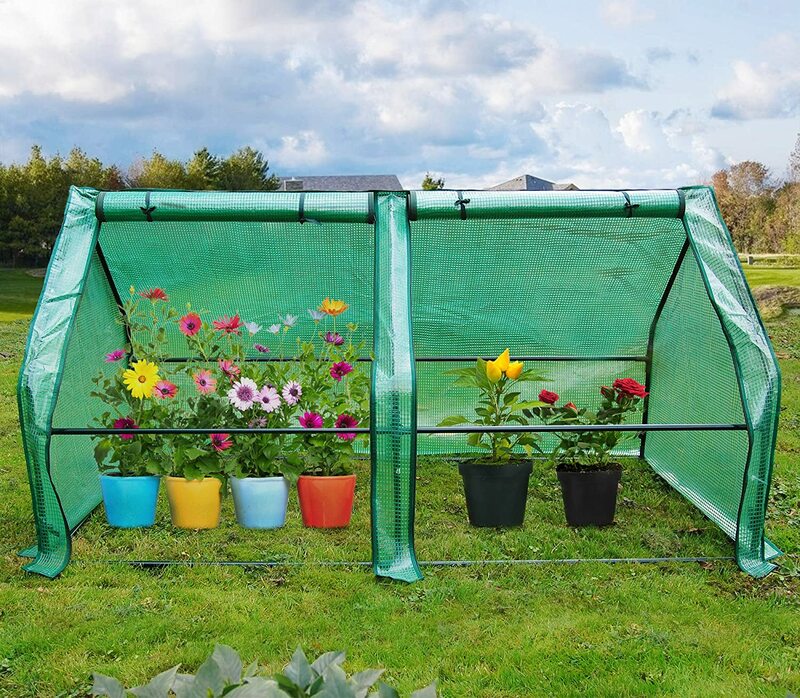 All the reviewed products are great but if you are a beginner and want to start having fun gardening or is looking for a convenient way to have a fruit tree, then the Abba Patio Fully Enclosed Lawn and Garden Greenhouse is one of the best greenhouse in the market. This little gem can possibly turn your backyard into a Garden of Eden with a nice fruit tree. 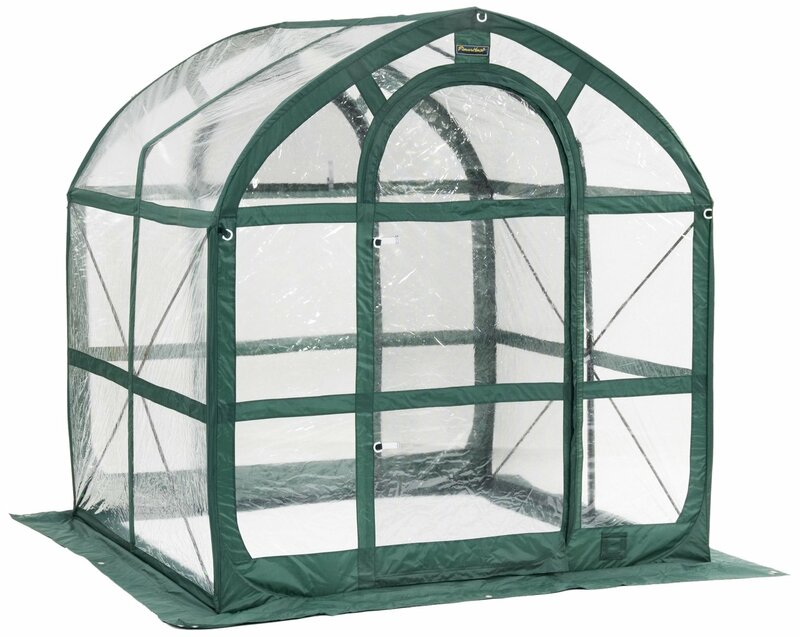 It is a very portable greenhouse and has a sturdy design. Happy gardening, folks!